Why, in an age when online privacy is a bigger issue than ever before, are some bloggers happy to share one of their most personal of details: How much they earn. That’s right: every month, bloggers are sharing a line-by-line breakdown of their earnings with thousands of people. These breakdowns are more commonly known as income reports, the focus of today’s post. But why do bloggers publish income reports? And, more importantly, is it something you should be doing? Today, I’ll do my best to answer these questions by looking at the pros and cons of income reports. And, if you’re in need of some inspiration, I’ll also be introducing you to 12 of the best income reports for WordPress users to follow. Let’s get started. Should You Publish Income Reports? It’s an issue that divides bloggers: to publish income reports or not to publish income reports. Some share their income every month like clockwork, while others won’t even entertain the idea. It has to be said, however, that the bloggers who publish income reports are in the minority. And, if most bloggers don’t publish them, then why should you bother? Well, there are actually lots of good reasons. Here are eight for starters. Earning a living online is difficult — it can feel like an uphill struggle at times, especially if your effort has yet to bear fruit. Income reports show readers that there’s light at the end of the tunnel; that there is good money to be made. This can be the shot in the arm they need to keep on trying. It’s also worth pointing out that income reports document the whole journey — not just the good times. Realizing that your favorite superstar blogger overcame the same struggles that you’re experiencing can be hugely motivating. Whose advice are you more likely to trust: a blogger earning $10k/month or a blogger earning nothing? The answer, of course, is the $10k/month blogger. If people know you’re successful, they’re more likely to sit up and take notice. This can increase your readership and add extra zeros to your income. By documenting your failures as well as successes, your income reports make you more relatable. By knowing that you’re a real person who makes mistakes, you can develop a more personal relationship with your audience. If your goal as a blogger is to help your readers earn more money from their websites, income reports can offer a lot of value. This is because, typically, income reports share a blogger’s many revenue streams, which can help readers identify new ways to monetize their own website. And, if you break down your income piece by piece — for example, listing the earnings from individual affiliate schemes — readers can identify the biggest opportunities. Some bloggers say that they write income reports for themselves first, readers second. Think of it like a diary — you can use your income reports to document the things that worked, as well as the things that went wrong. Learn from this, and you’ll avoid the same pitfalls. It can also be inspiring to see how far you’ve progressed as a blogger, which can keep you motivated during lean months. Many bloggers share their future plans in income reports, giving visitors the opportunity to chime in with suggestions via the comments section. Sometimes these comments will validate your plans, or perhaps introduce you to a new way of thinking. Many bloggers publish income reports purely to hold themselves accountable — by making next month’s plans public, you’re more likely to stick to them. If you fail to meet your targets, expect some friendly ribbing in the comments. The final benefit is perhaps the most obvious: people like reading income reports! This makes them a great source of traffic. If you read a blogger’s income report one month, you’re more likely to drop by next month to see how they did. This can turn a casual reader into a lifelong fan. Of course, income reports aren’t without their problems — otherwise, everyone would publish them! Let’s take a look at some of the reasons not to publish income reports. Your income is nobody’s business but yours, right? Some people just don’t want others prying into something as personal as their income levels. Haters gonna hate, right? If you regularly post five- and six-figure months, it won’t take long for jealousy to rear its ugly head. Some people might find your earnings inspirational, others will scrutinize everything you say, looking for opportunities to call you a liar. In many ways, it’s unsurprising that income reports attract scrutiny, as some bloggers — *cough* scammers — do falsify their earnings. Although it’s ethically wrong, if you pretend to be successful, some people will believe you and buy your products. This causes some people to view all income reports with suspicion. If high revenues can boost sales, low revenues can certainly hurt your potential growth. After all, is a blogger earning modest sums really the best person to grow your website? Sometimes, sometimes not. Remember: new bloggers are still capable of giving great advice, even if their income levels have yet to catch up with the value they’re offering. Unfortunately, not everyone will see it that way. Sure, income reports can be motivational. On the flipside, though, when your earnings become too large, you become totally unrelatable. If a reader is earning, say, $200/month, there is a huge disconnect between someone earning $10,000/month. This may result in some readers believing your advice isn’t relevant to them. The main problem with being totally transparent? Anyone reading your income reports regularly will know the ins and outs of your business model. Some will use this for inspiration, while others will simply rip your idea off. This is a problem I’ve read about in a number of income reports — the moment a blogger becomes reasonably successful, their industry is flooded with copycats. These aren’t people trying to improve on your idea — which, let’s face it, is a part of doing business — these are people simply looking to duplicate your business without adding any of their own brainpower. It goes without saying: producing 3,000-word monster posts documenting everything you’ve done in the last month can take a serious amount of time. And, when you start publishing income reports, your audience begins to expect them every month. Some bloggers decide that the effort that goes into producing them just isn’t worth it. Are you publishing your income reports to motivate your readers, or to brag about all the cash you’re making? Even if your income reports are published with the best of intentions, some readers won’t see it that way. Whether you want to publish income reports or not on your blog, you can still benefit from the income reports published on other blogs, right? That’s perhaps one of the reasons why income reports are so popular, even if they’re not published universally. In this section of the post, I want to introduce you to 12 of my favorite income reports. Some of these businesses operate in the WordPress industry, while others simply use WordPress to power their blogs. All of the businesses listed here, however, earn their income (almost) exclusively online. In my opinion, this makes these results attainable to any WordPress user — provided you work smart and put in the prerequisite effort. I’ve also deliberately picked a variety of businesses — service providers, bloggers, affiliates, technical niches, non-technical niches, beginners, established — to reflect the many different ways that WordPress can be monetized. If you’re considering starting your own WordPress-based business, look no further than WP Curve for inspiration. 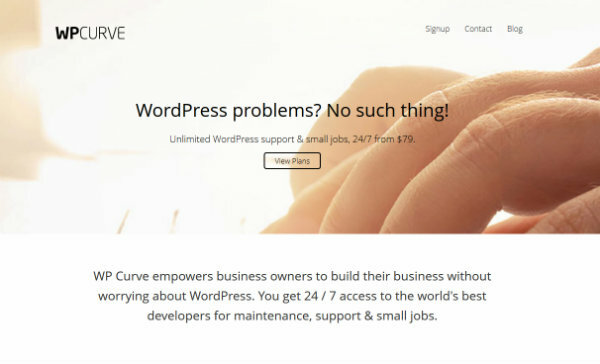 Co-founded by Dan Norris and Alex McClafferty, WP Curve quickly established itself as the number one place for WordPress support, maintenance, and quick-fixes. Their income reports make for a fascinating read, with complete transparency on income, traffic figures, and even an insight into their business mechanics. There’s also in-depth analysis on what has worked for them and what has gone wrong, as well as a look towards future plans. As one of the longest-running income reports in the list, you can follow WP Curve’s remarkable growth from scratch through to the latest income report, which showed monthly recurring revenues of over $65,000. Every month, CodeinWP publish a fantastically detailed income report. They’re the guys behind ThemeIsle, so that makes their reports a must-read for all aspirational theme developers. In the whole of 2013, their business brought in a big fat zero. The team was able to turn around their business, and by May 2015 they were bringing in a whopping $80,000/month. Best of all, each income report offers a comprehensive look inside the different aspects of their business, giving you a more complete picture of how they turned around their business. Although the income reports are relatively new (there are just five editions to date), each one provides a lot of value. 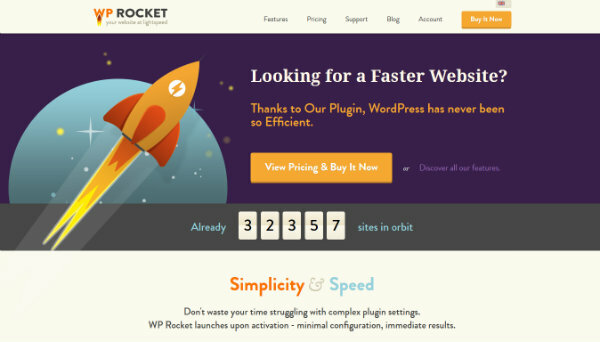 Next up, we have the income reports from the company behind top WordPress caching plugin, WP Rocket. With six updates so far, it’s another income report series in its infancy, but it documents the remarkable rise of WP Rocket. Within two years, the company was able to increase monthly revenues from zero to a stable $45,000. The income reports include revenues, customer figures, and also detailed insights into the WP Rocket business, in accordance with their transparency policy. OK, so not really an “income report,” the Envato marketplaces, ThemeForest and CodeCanyon, still make it possible to track what any seller is earning per month. For a start, there’s a dedicated section on each marketplace, displaying how many sales the top themes and plugins shipped. 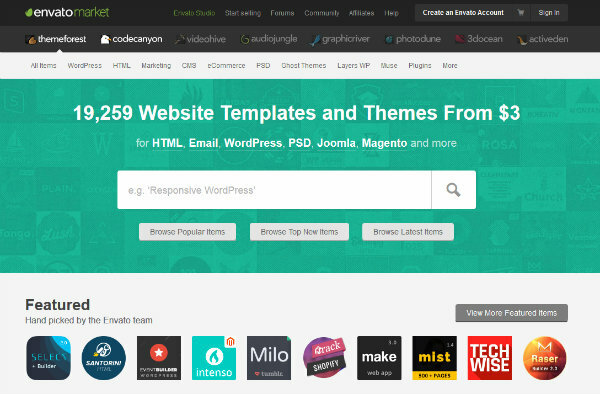 You can also manually track a specific seller by visiting the Top Author pages – this one for ThemeForest, this one for CodeCanyon. By keeping a record, you can then calculate how many sales an author made over a particular week or month. All authors are listed here, so you can calculate approximate earnings for the power-sellers, as well as the more modest-earners. Of course, it’s not just WordPress-based businesses that publish income reports – plenty of other successful online entrepreneurs are happy to do so. A great example of this is Matthew Woodward. Matt publishes all kinds of internet marketing tutorials on his website, though I would say he is an SEO and affiliate marketing specialist. His income reports span a period of three years to date, allowing you to trace Matt’s journey from beginner blogger to an award winner earning over $20,000 most months. 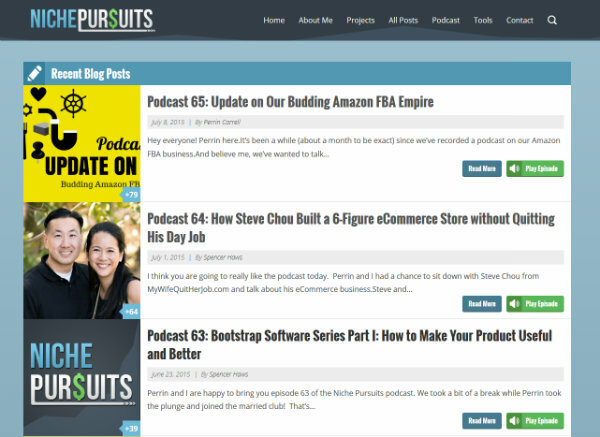 Niche Pursuits’ income reports were a great source of inspiration for me when I started using WordPress several years ago. It’s great to see that site owner Spencer Haws continues to publish regular income updates. 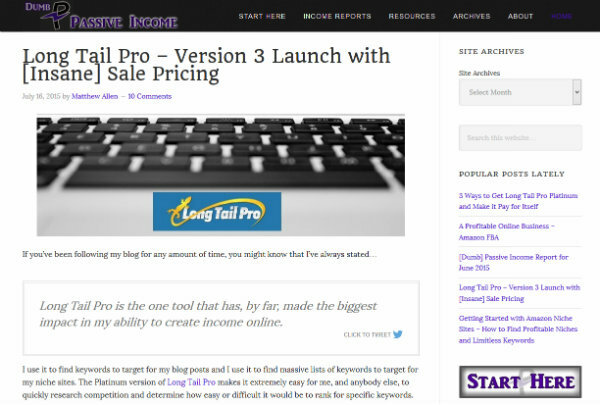 Spencer is probably best known as the creator of Long Tail Pro, one of the best keyword research tools available. His income reports, however, cover all manner of projects. Best of all, they’re completely transparent, guiding readers through the exact steps Spencer took to achieve his results. To date, his projects include niche websites, authority websites, Kindle publishing, and Amazon FBA. Standing out from a crowded marketplace is the key to a successful business. 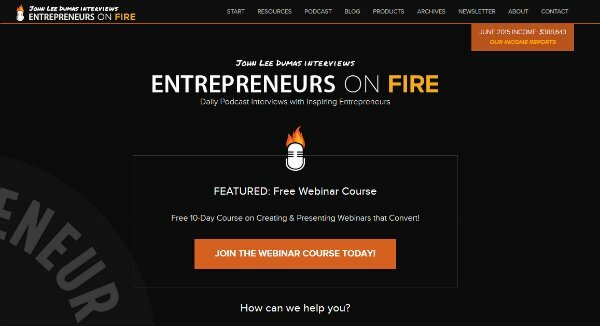 John Lee Dumas, the business podcaster behind Entrepreneurs on Fire, understood this concept well, as he set out to create a daily podcast series – a publishing schedule that none of his competitors were even getting close to at the time. You can follow John’s progress on his blog, where he publishes regular income reports. These days, John earns a cool quarter million dollars each month, and extensively documents his successes and struggles every month. 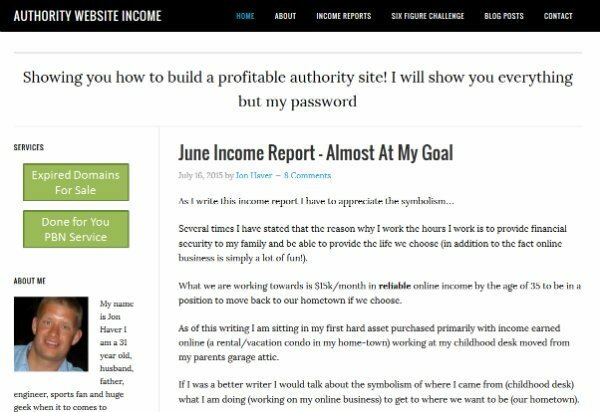 Patt Flynn was one of the first bloggers to start publishing income reports over on his Smart Passive Income blog. You can track his monthly results as far back as 2008, giving you nearly eight years’ worth of reports to sift through. Back in 2008, Patt was earning a still-impressive $8,000/month. Fast forward to today, and Patt regularly clears the $100,000/month barrier. In fact, in his best month his revenue was a jaw-dropping $153,000. As one of the top internet marketers in the industry, you can learn a lot from Patt’s blog, and also receive a good injection of inspiration from his income reports. Jon Haver is the successful internet marketer behind the Authority Website Income blog. He has documented his successes and failures since the October 2012, sharing his journey to a reliable $15,000/month every step of the way. In that timeframe, Jon has built an impressive 150 websites, and is now pursuing his goal by aggressively purchasing several niche websites each month. Through his income reports, Jon demonstrates just how much money it’s possible to make by developing a portfolio of niche sites, website acquisition, and better monetizing your portfolio. 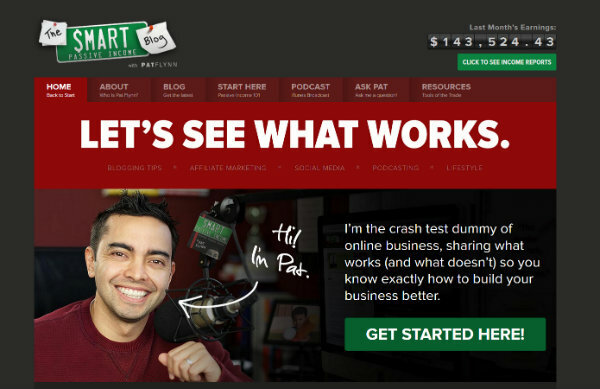 Matthew Allen is the truck driver turned internet marketer behind Dumb Passive Income – a play on Patt Flynn’s Smart Passive Income. 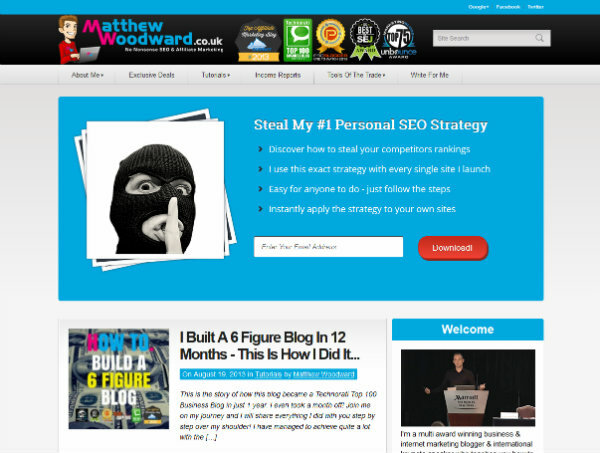 Every month, Matthew shares his successes with his audience, with 33 income reports published to date. Matthew’s online business is only a side hustle, and one which nets him around $3,000/month – not bad at all. Matthew earns primarily from niche websites, AdSense, and Amazon Affiliates. He’s completely transparent about every arm of his business, so there’s a lot of useful advice published. So far we’ve focused exclusively on WordPress-based and online marketing business. Not every WordPress user wants to talk about internet marketing, however. Many use WordPress to power a completely unrelated website. And guess what? Those websites can still earn good money. 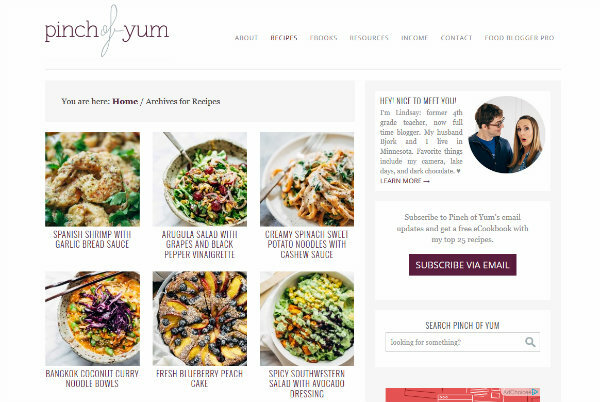 Perhaps the best example of this is the fantastic Pinch of Yum – founded by food blogger Lindsay Ostrom. Her website is WordPress-powered and uses the Genesis Framework. Lindsay monetizes her blog via affiliate commissions, sponsored posts, and eBook sales. Last month, those revenues added up to over $31,000 – after factoring in expenses, her profits were just shy of $25,000. 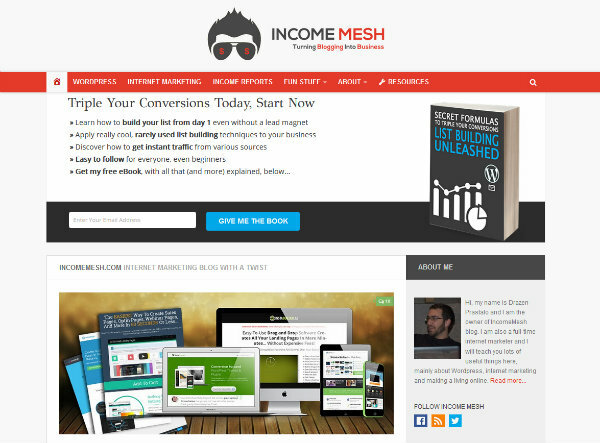 For any niche site builders out there, Lindsay’s income reports are a must-read. 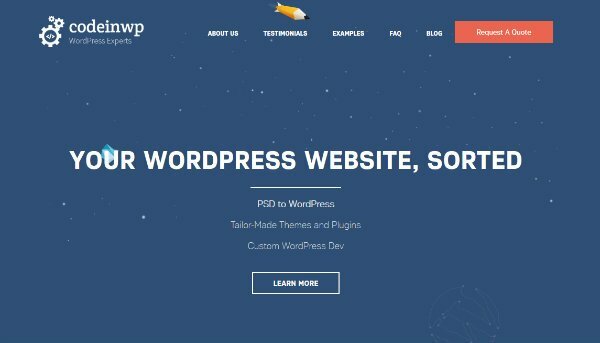 Although the eye-watering incomes we’ve covered so far are certainly inspirational, to many newer WordPress users, those results feel unattainable. If you’re struggling to earn your first dollar online, the thought of earning five- or six-figures each month can feel a million miles away. With this in mind, following along with a less-established blogger’s journey can feel more realistic. For this reason, I want to throw the Drazen Prastalo’s Income Mesh into the mix. Drazen’s latest income report showed a more modest $500/month, but he’s an internet marketer on the way up. If you want to see the established bloggers more humble beginnings, be sure to go back through the income report archives to find a time when they were at your level. On one hand, income reports are a great way to attract an interest in your blog, enhance your reputation, and boost traffic. On the other hand, income reports can make your more skeptical visitors view you as egotistical, unrelatable, or an outright liar. Even if you decide not to publish income reports on your blog, you can still use others’ income reports as a source of inspiration, guidance, and even entertainment — personally, I enjoy reading about the progress a blogger is making. With this in mind, be sure to check out the 12 income reports listed today — I’m sure you’ll find something useful! Do you publish income reports on your blog? If so why? If not, why not? Share your thoughts in the comments section below! Thanks for the info! I run a review website that makes some money through affiliate programs. I haven’t published any reports but I have considered it. I do tell how the money is used so my readers will feel comfortable using my links. I’ve felt the exact same way Artem! It feels like the “Infopreneur track” is the ticket to earning big money online. I suppose if you’re trying to tell people how to make money online, your website is a more natural fit for income reports, so that’s why there is a strong link between the two. Income reports feel a little out of place on website’s like Pinch of Yum, probably because readers are more interested in recipes than website metrics. That said, I think it’s great when those types of websites do share their performance so openly, as it proves there is money to be made in other niches. The more people who realize that, the better! On the other hand, for those who writing food blogs themselves, these income reports on Pinch of Yum are inspirational and contain very valuable information on how to grow their own food blog. I have a crafting blog and I have found great tips when reading the income reports of other crafting blogs. There aren’t many of those income reports out there so I’ve been thinking of adding that to my own site. I just haven’t taken the plunge yet. I would just say the opposite. I believe that people should not publish their income report. That sentence is super weird and misleading. One of the guy in the list promotes so many ABC tools that makes him the most money. Does it mean that we should also promote those tools to make some affiliate income? It just does not make any sense. Just imagine that I have a blog and telling you “you can do it, too” to encourage you and click some affiliate links that would make me more money. And you get almost no share from what I do. – Incomes should be private. While you are having your beer in a hawai beach and showing off you life, there are millions of people out there working for 5usd/day struggling to do something more profitable in their life. And income reports are not what they are looking for. – When you teach something to someone, it does not mean they can do it as well…. So many other things to be said, however, I prefer to keep it short. People should keep their money private. Thanks for your comment Burak, and I respect your opinions. I think that, quite rightly, you point out that some people post income reports to encourage affiliate clicks — i.e., I’m using this to earn X amount, you should buy it so that you can earn the same. These types of income reports are bad, and do more harm than good. Not every person publishing income reports is doing this, though. I genuinely believe that a lot of good people use their income reports to help people by inspiring them. I know that when I started out, I followed quite a few income reports, for a mixture of entertainment and inspiration. I knew that by reading I wouldn’t become rich overnight, but it did show me what was possible, and that caused me to keep working hard. And many of those other people struggling to make a living probably find this motivating, too. I think misleading people to get affiliate commissions is wrong. This can take many forms, though, it isn’t just income reports — misleading product reviews immediately spring to mind. If you prefer to keep your income private, though, then that’s a perfectly valid decision. I look forward to reading income reports from others, especially Pat Flynn, Matthew Woodward and Pinch of Yum every month to motivate me, as validation that people can earn online more than working a 9-5 job. Some only documenting what works for them, not forcing you to follow their footsteps, thus earning them affiliate sales. Only you know what works best for you. you got the right point here but i don’t think there is any pros in sharing income reports, the main motive of some bloggers to share income reports just to attract new bloggers to get trained by them, that’s it. I completely understand your point, and I can understand people viewing income reports with suspicion. I think that online coaching just comes with the territory of the “make money online” niche, and these are the websites most likely to publish income reports — if I’m interested in making money online, then I’m bound to be interested in what the blogger I’m reading is earning. It’s usually painfully obvious about who is lying about their income levels anyway and who is trying to help people. I think that many of these bloggers would offer online coaching either way, though, whether or not they are publishing income reports. Thanks for the information in a well written article. Some of the outrageous passive income figures are hard to believe at first glance. Obviously the numbers of people accessing the Internet can bring that kind of income provided you know what you are doing. Doing research on the subject of online passive income reading the disclaimer, if there is one, gives a real picture. Otherwise, Pat Flynn’s Smart Passive Income looks just too good to be true. is an advantage and sort of authenticates him. It still leaves the question… is it all legitimate or hype to get me to pay him $$$ for his program to also be able to do what he is doing? Yeah, outrageous earnings are difficult to believe. I prefer income reports that feel more attainable myself anyway. As I’ve mentioned in some of the comments above, you can usually tell who’s being completely honest about their earnings. There’s usually a humbleness to their reports, and there’s an openness about the bad times and the mistakes that have been made. Plus you can go through the archives, to see where the big numbers came from. For what it’s worth, I’m a big fan of the Matthew Woodward income reports! Personally I am not interested to share my income report. Sometimes income report invites more compitators in same market . Though it have many pros but I am not going to share my income report. Here you have PressLabs – http://www.romanian-companies.eu/presslabs-srl-28378350/ or us : http://www.romanian-companies.eu/vertigo-studio-srl-29109287/ . Despite the cons, income reports are truly inspirational/motivational, at least for me. Unlike conventional careers, self-employment does not come with a salary approximate—there is no online listing for what you can make as a blogger/via self-employment, excluding information obtained via income reports. Maybe a lot of people despise the idea of them because money is a controversial/touchy topic for several people? I’ve found the bloggers who are transparent with their income to be smarter about how they spend their money… Income reports are a vulnerable thing. They’re scary to post. However, they’re also really helpful. I actively follow POY’s income reports, because I admire the setup and fancy their technique. I guess I’ve been lucky not to come across people using it as a marketing gimmick/lying about their income. Great read – couldn’t have summed up the pros and cons better myself. I recently started publishing income reports myself, but I had to really stop and think hard about starting. 3 months in and I’m still not totally sure it’s the right move – the downsides that you’ve mentioned are very real – but I’m gonna stick with it for at least a year and re-assess after that. If you want to teach how to make money online, you have to show proof! Income report can help you with that!